Tonight, as I drank root beer (diet) and made tuna salad, I had a flashback. It was this moment many years ago as a teen, when my dad made a salad and then dumped a can of tuna on it. I thought it was the most disgusting and weird thing I’ve ever seen. Guys… let this be a lesson: we become our parents. I will give in to tuna salad and root beer, but that’s where I draw the line. I remember as a little girl that going to Grandpa’s house was always proceeded with a lecture about behaving. This was out of the ordinary for us, as we were always so well behaved. I am sure that people talked about us the way I’ve heard people talk about other big families. Six children. Loud. Unruly. Traviesos. We didn’t have a television, so Grandpa’s house was a real treat! We would wait until one got up the confidence to ask if we could watch tv. We would play by running around the circle that was created by a bar in the kitchen. We would stare up at the huge grandfather clock and the swords hanging above the fireplace in wonder. After all, who has swords in their house? Jacinda, the littlest, would crawl in the space of the coffee table. And the rest of us would with glee get glasses of ice water, kool-aid, or lemonade. Any excuse to fill our cups with the ice from the freezer door ice maker. I can compared us then to my nieces and nephews now, and I see such similarities. We must have been such brats, and yet we always had some kind of treat waiting for us. I know that was largely Grandma Carol. 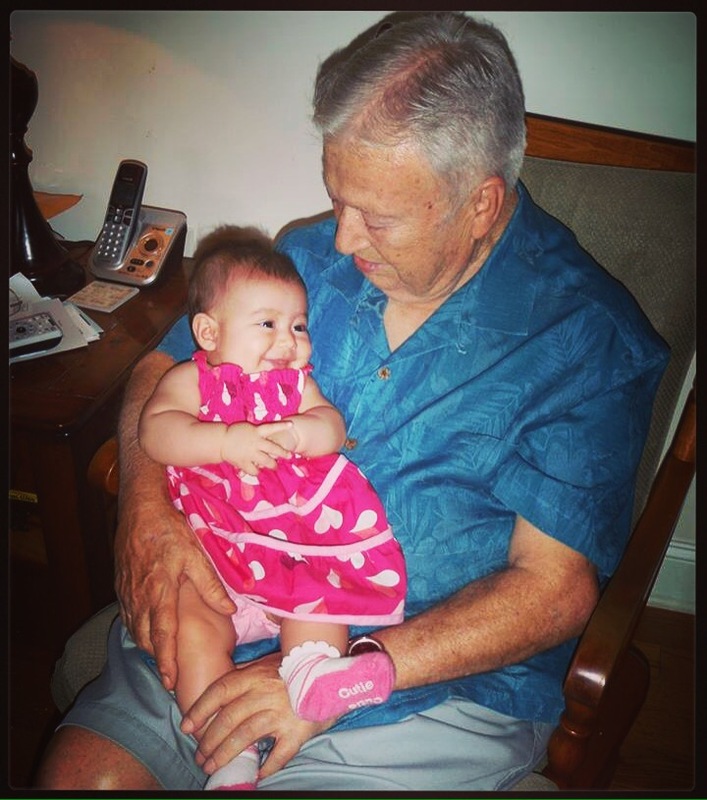 She was more tender when Grandpa was still perched on his throne as the king of our family. That’s what it felt like! Not because he was unkind to us. I never remember Grandpa being unkind. But he always had “a chair” that was his! And as the patriarch, there was a level of aloofness that even children could recognize. You know what I think? Grandpas and Grandmas shouldn’t have to be “bad guys.” They should get to enjoy their grandkids then send them back home. Grandparents should get to fuss at their own children for their unruly children, with their grandkids blissfully unaware. And parents should be conscious of the difference in tolerance of older people. I haven’t been there for each family reunion. I don’t get to see the ups and downs of waging wars on health like my family does. I get to see differently–as if observing my parents and grandparents age through a series of photos rather than in real time. I get the yearly visits (if I am lucky), and reminders to email. I get to see the tenderness of an old man, without much of a memory of who he was before. I hate the photo that was chosen of my Grandpa for his obituary. That’s a man I don’t remember–one I have only heard stories of in whispers of virility and pride. I love the picture I have in my mind: my Grandpa sitting in his arm chair, waving us over for hugs, or cradling his great-grandchildren with unspoken tenderness. I see him in my father’s face, the best parts of him there, kindness and gentleness that multiplied with age. At the end of a life, it’s the kind memories that matter most of all. You should know, your daddy loves you more than any other man ever could. Someday, if your path leads to marriage, you will began looking for a husband. I am hoping that day will be when you’re older–and wiser about what you should look for in a mate. Oh! how I wish I could tell you to hold out for the right man! But if you’re anything like your mama, you’ll have to find him the hard way. A couple days ago, I asked your daddy, “Victor Papi, what’s the best thing about being a dad?” He paused for a moment, and replied, “Having a daughter.” My heart melted. You are his treasure, he’ll do anything to give you the best (not the most expensive) things in life. That doesn’t mean toys and electronics, baby. Nope! That means that he is willing to stay in Mexico as long as necessary, because you need to speak Spanish proficiently. He can’t wait for you to learn all the things a good Mexican (woman) knows. “Someday,” he tells me, “I want you to teach my baby how to make tortillas. And she needs to learn to put things where they go. I don’t want her to put her things all over the place.” I can’t wait to teach you how to be a Mexican, my love. But you must learn to be American too. So if you choose to have a Mexican husband, you should let him make tortillas every once in a while. Let him change the diapers, cook the supper, and mop the floor. Because a good American woman lets her husband share household responsibilities. Giving you the best means that he is willing to stay home with you all day long–even when he’s going crazy being stuck in the house. It means that he washes your cloth diapers Mami bought you, because he wants the best from your head to your toes bottom! It means that he will go with you to get your shots, even though he starts to tear up when you’re in pain. It means that he is willing to cut a trip short to see his parents, because he doesn’t want you to be hot and covered in mosquito bites! Oh, honey, you are so loved. I’ve been thinking about this miraculous family unit–and how the gears all work together to make things run smoothly. One gear out-of-place and things get rough. Squeaky gears need a little attention to get going. When everything works together–progress can be made. My little squeaky is really growing up so fast. I’ve heard people say that all my life, “They grow up too fast.” I never knew how true those words were until now. Her six weeks are literally just around the corner, and this mama is heading back to work. It’s a good thing I really love my other job (teaching)–because I might start squeaking too. I suppose I could twist that to mean that God gave us Mamas to keep the Daddy’s on the right track… But in all honestly, she proceeded to tell me that kids need a little rough play every once in a while. Kids also need time alone. This is what my husband has taught me this week. The Mama in me wants to cuddle, love on, and snuggle my little bug all the time. I want her naps to be beside me on the couch–not out of my sight. I want to jump when she says, “Wah” and fix everything wrong in her little world. I want to make sure that she doesn’t get hurt by padding everything around her. I want her to have music and sweet sounds to sleep to. I want her to get to rock while she still fits inside the swing. This is why she has Papi. Papi said to me the other day, “She really needs some time alone. She’s going to get used to being in your arms.” I forget the word he used to tell me that she would be spoiled. I let him take her, change her diaper, and he returned without the baby. And guess what? She didn’t cry in outrage. My heart didn’t break in two. And I learned a lesson. Wah” becomes “Waaaaaaaaaaaaaahhhhhhhhhh!” you bet we both go running. Since then, I’ve tried to let little Sugar Bug do a little exercise on the floor–even when I am yearning for cuddles. She is becoming stronger–lifting her head and looking around. She’s learning to touch with intention, and loves to tickle her toy that jingle-jangles. And Mama is learning to give a little growing space to her bebita. See, God really does know what he’s doing. He gives us Mamas to cuddle and love on, and Daddys to help us grow. (That doesn’t mean that Papi doesn’t get his cuddles in there too, or that Mama doesn’t have words of Advice for growth…) Mamas dresses us up pretty every morning. 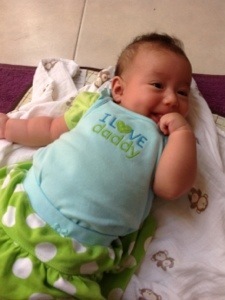 Papi wraps diapers in a no-frills-this-will-leak-soon way. Papi settles us down at night with no nonsense. And Mami hums a tune as she climbs in bed beside baby–her body rocking even though her baby isn’t in her arms. Mama scrubs baby up in the kitchen sink. Daddy worries that baby will be hurt from leftover pepper juice and germs. So how does it all work if Mama and Papi are so different? Mami and Papi and learning to keep mouths shut. This is allowing that machine of a family unit to get moving the way things were intended by a higher power. Because the minute we start tinkering–trying to change the way things are done–it all will fall apart. My mom said this to me the other day, “That’s what you get, Jania, for giving your Daddy such a hard time.” She, of course, was referring to more evidence of me choosing a man just like my dad. Yesterday, on our walk, he tells me all about how when he builds a house–his room will be as far as possible from the street. The noise is just too much. I just continued on silently, but I was shaking my head and exclaiming on the inside. At night, my husband likes to enjoy a nice cup of hot tea. He can’t stand being late for anything–and will even head to class an hour early to wait for it to begin. Today, his frustration over us missing previews almost did him in. I thought we would have to pass on the movie altogether. And no, we can’t buy canned vegetables, because he just told me that he doesn’t like the way they taste. He prefers them fresh–and slightly crunchy when cooked. You should see the things he mixes together when he cooks. I am sorry, honey (and Daddy), but green beans, broccoli, and corn really don’t taste that great cooked in the same pot. I like to think that my birthday present to my dad this year was better than anything my siblings could (or would) give him. See, my little sister is concerned that because he is getting so old that he will die soon. I don’t want his heart to give out on him, so I periodically raise his blood pressure. That will work, right? So, this year I gave him a good argument on his birthday. I don’t know what it is about our relationship–because I could let it go if some other family member said the absurd ideas that he comes up with (See how I do that?). With him, I just have to let him know how ridiculous I think they are. It’s become clear to me as I continue to go through these wacky hormonal changes, that I really have no idea what’s up with my body. I keep thinking, “Maybe that’s because I am expecting.” Then reality comes knocking, and I remember that I had the same problems quirks before I conceived. Remember when I told you about me chewing out the clerk at the Oxxo? I really would like to believe that it was because I was hungry and in need of a snack. And maybe it was! But the truth is–even before this little guy took up residence in my uterus, I got crabby when I needed a snack. Before I get any lectures, know that I really do eat soooo much healthier than I have pretty much my whole life. But the other day, I bought a six-dollar box of Captain Crunch Peanut Butter cereal. Yummo! I just said, “This is my favorite cereal in the whole world!” And when the girls encouraged me to buy it because I am pregnant, I said, “Okay!” Sigh. I also now drink two glasses of chocolate milk a day. In the morning, it makes me feel less like throwing up. In the evening, I just really like it before bed. This might ACTUALLY be a pregnancy thing. I was never crazy about milk like my other sisters. My mom tells this story about when she went to read to my sister’s kindergarten class. She cried in the story, and a little girl sneered at her. We used to always laugh at Mama when she cried. Just the saddest little song or story would set her off. Well, kids, let this be a lesson: Don’t laugh at your Mama. You never know when you will become just like her. With that said, today I cried. I was teaching a lesson on both writing personal stories and making connections to literature. Who better to demonstrate those qualities than Tomie dePaola? So, with a little Nana Upstairs Nana Downstairs action, the fun began. I laughed off the tears, but made sure that I emphasized that sometimes when we make connections to text, we laugh. Or cry. The problem? I also cried two years ago when I read When I Was Young in the Mountains to the kids. I’ll admit: the baby had little to do with this. This was karma paying me back. They say pregnant women get tired. I know it’s true. It was pretty much my first clue that I wasn’t alone. I remember taking my little travel blanket (it was given to me when I came to Mexico by a friend who said it was her favorite travel accessory–I seriously use it weekly…) to school and curling up on the tile floor away from the video camera to take a little nap. But then again, little naps are my forte. And if that is all you need as an indicator, well then, my dad, Master Napper, has been pregnant my whole life. With that said, I guess it’s safe to say that this mess of a woman has always been a mess. With or without a baby-to-be, some things will never change. This past week was the first time I’ve ever had a class with whom I can make Father’s Day cards. In the five years I’ve been teaching, there have been countless absentee dads–and ever year I’m reminded how lucky I am. I mean, let’s be honest: it could have played out differently. My parents knew each a short three months before they eloped. I guess they knew they better say “I do” and stick it out. They were young. They were broke. And they started our family a year(ish) later. It shouldn’t have worked, but it did. A few weeks ago, I almost wrote a blog about how to succeed in a relationship. My key is to be like your Mama and date your Daddy. Then I realized that a lot of people might not understand that–but it’s true. And perhaps that’s the highest compliment that I can give my Daddy. Victor is strangely like him. (He even saves his coffee cup for repeat use–something I’ve fussed about for ten years or so…). He has worked hard his whole life for his family. He eats anything I fix–and even compliments the gross things. (Once I made garlic mashed potatoes–before they were popular. My whole family refused to eat them. Except Daddy.) Sometimes, all I think he is missing is an old bathrobe to hang around in the house. 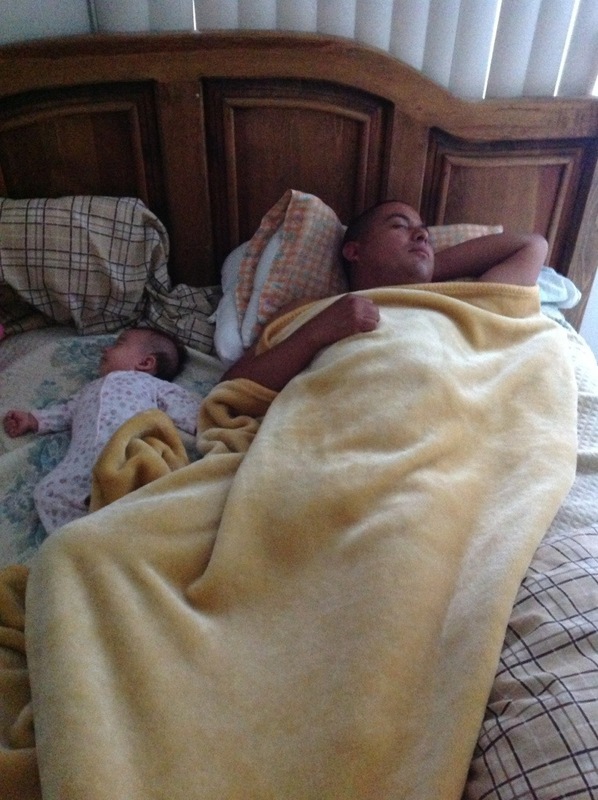 Today I was thinking about how we used to always sneak down to Mama and Daddy’s room when we had nightmares. I was banned to the floor. Apparently I kick in my sleep. All I could think was, Well, at least I didn’t pee on your head…. My sister did that. Why wasn’t she banned to the floor? I could let it bother me, except I know a secret. I know who Daddy’s favorite is. Feliz Dia de Los Padres, Papacito!